In recent times many utility sites have been classed as ‘High Risk’ from possible terrorist threat. The security upgrades of these sites stressed great concern of the access points (gates / automatic gates). Inova automatic gates high security solutions have won many testimonials from government bodies, major utilities and local authorities making them the market leader in this area. We work closely with architects/ specifiers to tailor designs to suit individual needs and requirements, and are extremely flexible in our manufacturing capabilities. This allows us to adapt bespoke infill’s to the gate unit and third party integration into the overall system . Talk to us about how our specialist range can offer bespoke solutions to those with high security as their paramount concern. Vast choice of infill, including 358 prison mesh, perforated sheeting and other high security infill. Solid sheeting gate units to various heights and widths. Extremely reliable in harsh weather / working conditions and applications with high usage. All Inova specialist automatic gates are fully compliant to BS EN 13241-1, including extensive documentation on maximum permitted closing forces and documentation on the prescribed initial testing of the complete gate by an authorised body. These units exceed all European Standards. BS EN 60335-2-76. The systems are designed to interface with Intruder Alarm Systems or CCTV. With its unique award winning motor and beam design, Inova automatic gates have ‘ALL’ the drive mechanism inside the lower beam, unlike conventional models that have part of the running gear inside the beam and the rest outside. Inova specialist gates automatic gates with 10Kv electric fencing is the ultimate in site security. 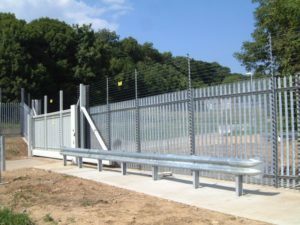 It can be attached to existing perimeter fencing or used as a stand-alone system. The physical presence of the fence along with prominent warning signs deter would-be intruders and give a superb front line deterrent. Galvanised high-tensile steel wires are spaced 95mm apart and carry the high voltage pulse down alternate wires every second. The wires alternate between live and earth and this, with the addition of constant monitoring of the Electro Fence for attack, creates an alarm if any of the pre-programmed conditions are met. The controllers have full battery back-up, so if there is an interruption to the power supply the battery back-up automatically takes over for approximately 24 hours. All systems are designed, installed and maintained to the advanced perimeter systems codes of practice and also the new British standard for electric security fences PAS47. Strict codes of practice are enforced to ensure system conformity, and as such carry an indemnification cover. 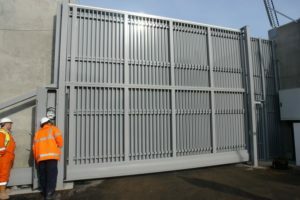 In conjunction with perimeter protection specialists, like RH Irving Industrials, Inova Gates Ltd have years of experience in the design, installation and maintenance of 10Kv electric fencing systems along with CCTV. Our in-house installation teams will carry out all aspects of securing a site from perimeter fencing to automatic electric gates, automation, CCTV and security barriers / security fencing. This enables us to take care of all your potential requirements under one contract, if required. Contact us to find out what we can do for you. Call +44 (0)28 7962 7264 or email sales@inovagates.com.